Today I'm gonna do a review on ITOH Low Molecular Collagen Powder. It's endorsed by Kevin, Taiwan Beauty Guru! ITOH Low Molecular Collagen Powder was extracted from healthy pigskin and cartilage, which are tested by Japan SPF standards. Besides, fat and gelatin are removed thru high purification technology. ITOH collagen is natural and free of chemical composition, making it suitable for all except vegetarian. In addition, it is approved by FAO and WHO hence they are safe to consume. Now you might be thinking "what's the use of collagen?". Collagen helps your skin stay radiant and elastic, keeping dry, flabby and wrinkly skin away! Each box of contains 14 sachets of ITOH Low Molecular Collagen Powder. The best thing about this collagen powder? The powder is white, but when it dissolves in the solution, (eg. plain water) it is colorless. It's stated to be tasteless and non-sugar so it won't affect the taste of whatever you mix it with. this helps to capture all the benefits that collagen contributes! 3. It can be dissolved in any drink or soup. ITOH collagen can be added directly, to hot soup, food or drinks such as coffee, juice, milk or water. Just pour it into whatever drink you order. Couldn't tell if it had any other taste when I mixed it with green tea. It just tasted like green tea. 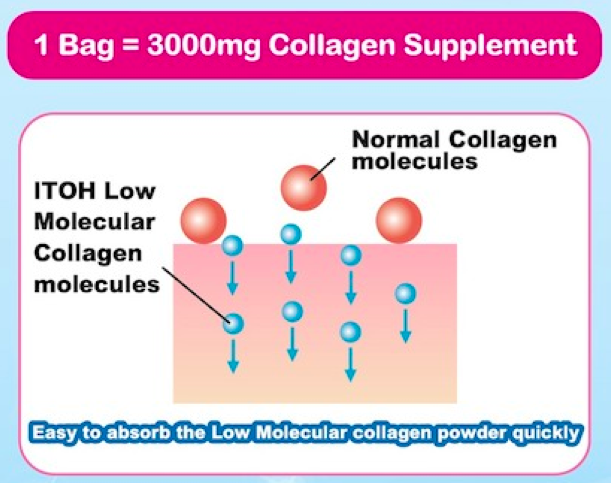 It is advised to take 1-3 sachets of ITOH Low Collagen Powder per day on an empty stomach. As ITOH Collagen is formulated thru high purification, it can be easily assimilated by our body system. Hence, it is said that result is usually visible after 1-2 weeks! But note that it may vary with individual. Each box of Itoh Collagen Powder is retailed at $49.90.